Author’s note: Baking for Good was recently featured as a gift that gives back on iGiveTwice, an awareness campaign I started to encourage people to choose gifts that have a social benefit. Ask Emily Dubner what her company, Baking for Good, is and she’ll explain how it’s an online gift giving site, online bakery and fundraising tool. When you buy cookies and bars made from local and natural ingredients from the online bakery, 15% of your purchase is passed on to a non-profit or community fundraising group that you choose. Dubner launched Baking for Good in September 2009 with the idea of creating a continuous, online bake sale that would provide an alternate choice to giving flowers and tie into the fundraising campaigns she loved as a kid. Working with a baker in Hermosa Beach, CA, she runs Baking for Good from her apartment in New York. I interviewed Dubner to learn how she came up with such a simple–and seemingly effective–concept, whether Baking for Good is profitable and who her first hire will be. What was your inspiration for creating Baking for Good? Around the holidays last year I was visiting my parents and a friend of my mother sent a gift of baked goods–brownies and cookies–that she had ordered online. Even though the process of sending this gift was similar to ordering flowers online, I thought it was so special and thoughtful; it seemed different. I’ve always loved to bake so I started thinking about what the market looked like for online bakeries. It seemed there was a lot of potential there because people don’t typically think of ordering bake goods online yet. So one part of my inspiration was the thought that baked goods make great gifts that can be shipped anywhere. The other part was that I had been thinking about the different fundraising campaigns we did as kids, like selling wrapping paper and candy bars. I started to think more about online fundraising and how it can be done differently in the 21st century. Specifically I landed on the idea of a bake sale. An online bake sale would let people buy delicious homemade treats and raise money for important causes at the same time. So I put these two ideas together: that baked goods make great gifts and that you can raise money with them. At first I envisioned the business as a school-based fundraising campaign with an educational component to it that schools would use to raise money. As I worked on it more, it became a simpler concept. As it’s structured now, Baking for Good focuses on the element of gift giving at the same time as transfering a significant portion of our profits, 15%, to a charity or local community fundraiser. Were you actively looking to build a business when you started Baking for Good? I was in management consulting when I had the idea. I always knew management consulting wasn’t a long-term thing for me. I had been doing it for three years since college. I’ve always thought about food-related things and would investigate various ideas. I actually had a different idea that I wanted to pursue first. [Dubner wanted to build a storefront bakery where customers could decorate pre-made cakes, similar to the Color Me Mine concept.] I realized that this first idea would require a lot of fundraising and have higher start-up costs. It just wasn’t the right time for it so I put it aside, but I did keep my eye out for different opportunities. When I came up with the idea for Baking for Good, although it was a much simpler concept, I did my due diligence and market research. I would encourage people to do their market research and talk to people about their enterprise. The concept of Baking for Good to our September launch was nine months. I didn’t. I went to Harvard and studied Social Studies, which had an economic component to it. I consider my business training to have been in consulting. Did you have experience with non-profits? I don’t have any formal experience working with non-profits. My experience came just from the fundraising I did a kid. I got a really big kick out of the campaigns we would do in school every year. My competitive nature always motivated me to sell a lot of the products. I also had experience volunteering with non-profits when I was growing up. How did you do your market research and what type of people to solicit counsel from? I talked with a lot of friends and family to test the idea from the consumer perspective–would they order baked goods online to send as gifts–and I talked with entrepreneurs. I was part of an entrepreneurial peer group at my consulting firm, so I worked with them as I developed Baking for Good. I also talked to friends of friends, whether they worked in restaurants and had an idea about restaurant marketing, or whether they worked for a non-profit. Did you raise seed money? I funded it all myself. In the beginning I assumed I could outsource everything and do it all inexpensively. It turned out not to be as low-cost as I thought it would be; it ended up being significantly more than I initially expected. Did you have to make sacrifices in your lifestyle while you were building the company? Yes, to some extent. I’ve always tried to be a good saver and I guess I made a good salary as a consultant, but I never spent like it. I’m usually pretty conservative. Also, once I left my job I started tutoring and that’s how I pay my rent now so I can reinvest profits back into Baking for Good. How did you connect with your baker Laura? I was looking for someone who had experience with online business, specifically with shipping products–someone who knows how to ship products without breaking and to maintain their freshness. I reached out to bakeries and bakers online. Of all the people I talked to, she was the most open to this. What’s been your growth rate? Laura’s been able to handle all of our orders and works with an assistant now. I’ve started to think about adding a bakery on the east coast for local events, which would allow us to cater for nearby non-profits more easily. How have you marketed Baking for Good? Built into our concept is the idea that the charities we work with will help us market Baking for Good to their membership lists. Initially I was hoping it would be all word of mouth through our charity partners. I do think we get a lot of business that way. I also used Twitter and Facebook in the beginning. Daily Candy’s national edition picked us up, which I think was through Twitter. It was almost too soon, before I was ready for it! I hired a publicist at the end of October/ There’s a lot of attention around the holidays. You launched in September. Are you profitable now? I did have startup costs and I certainly have not recouped those costs yet. That being said, the money that comes into the business has been able to cover our expenses so we’re self-sustaining right now. If I decide to launch a new product line it would require a further infusion of money, but right now we’re able to cover our costs. How do you account for the 15% that you pass on to non-profits? Our prices are equal to or lower than any other online bakery, especially one that makes all natural products with many organic ingredients. I consider the 15% to be the equivalent of what I would pay in rent if I had a storefront. Because I don’t have that cost, I can pass along 15% of sales to non-profits. Do you feel your business model is a significant differentiator in the market? Absolutely. I don’t think we would have received the majority of the publicity we have, with the exception of a few, if we didn’t have this charity component. I think the idea of a bake sale online is new, while the idea of a bakery in itself is not. We still market ourselves, but this part of our model definitely helps our marketing. 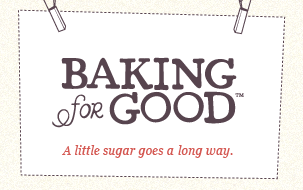 Does Baking for Good receive a tax credit for the donations you make? Yes. Our donations are tax deductible because they’re made on behalf of Baking for Good. This must help with passing on the 15% to non-profits. We’re going through the accounting for the first time this year, but that’s the idea. You process the donations for each non-profit that customers have selected at the end of each month. How long does that take? It takes a half-day to a full day. My developers built in a system at the backend, which makes it more straightforward. Is it hard for you to run this business independently? I live and work from home and live alone and work alone so it’s been an adjustment. While consulting, I was always traveling and working with a team. I love the flexibility of working from home and being my own boss but I look back fondly on my experience working on a team with others. Do you receive a lot of suggested non-profit beneficiaries from consumers? Yes, we probably receive two suggested non-profits a day from customers or from non-profits. Was it difficult to get the first non-profits onboard? It was difficult before we had a website to illustrate the company and concept. We were turned away by some non-profits but many were open to it, particularly local and smaller organizations. Some allow us to use their name, but not their logo. Do you have to prompt your non-profit partners to market Baking for Good? It depends. We have some organizations that have created amazing strategies behind their Baking for Good campaigns. For example, they’ll ask us in advance if we can feature them on the Baking for Good site in December when they send Baking for Good gifts to their large donors. Free Arts for Abused Children in Los Angeles has been amazing in their commitment to making Baking for Good a real source of fundraising. Many others will write blog posts about us or promote us through Facebook and Twitter. Do you have a standardized kit for your non-profit partners? I’m working on it. Hopefully I‘ll have one after the holidays. What non-profit were you particularly pleased to have as a partner? The executive director of City Harvest in New York heard about us and wanted to partner. That was very exciting for me. The Christopher Reeve Foundation also recently contacted us. As I mentioned at the beginning, I want Baking for Good to be helpful for small organizations so I’m also happy when a community organization like a school group or sports team contacts us. What’s your vision for Baking for Good 3 or 5 years from now? I would love for it to be people’s go—to gift giving site. I think it already is for some of our customers. I would love for people to see baked goods as the new flowers, as a great gift to give. Finally, I want non-profits and community fundraising organizations to see Baking for Good as an effective way for them to raise money. Has it been as easy as you make it sound? 9 months from idea to launch and you were able to self fund it. I don’t know if I would have had the courage to start a business that would have had a lot more dark days–like the first idea I was exploring. From the beginning, I saw Baking for Good as very doable. I had a vision for it and I was able to simplify it. The team who built the website was able to bring my concept to life. The hardest part for me has been the adjustment to working alone and I also put a lot of pressure on myself. I’m always wondering ‘Did that order arrive? Are our customers happy?’ So there’s been personal stress but it’s been remarkably smooth overall. I feel very lucky. How much doubt do you have as an entrepreneur, especially one who’s working alone? What type of work can you not wait to offload to your first hire? I think my first hire would have to be a web person. That’s the one thing I can’t do myself. But I definitely foresee other positions down the line. Do you still bake on your own? Yes, it’s still pleasurable for me because I don’t have to bake for work. Baking for Good is accepting Christmas orders through December 20. As part of my commitment to give socially responsible gifts, I ordered a gift basket of gingerbread blondies and chocolate crackles for my family in Philadelphia. I chose the American Cancer Society, a cause close that they personally connect to.